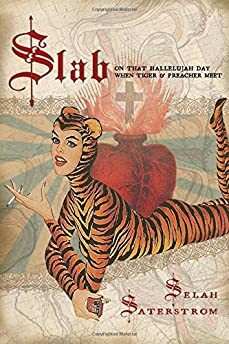 Largehearted Boy: Book Notes - Selah Saterstrom "Slab"
Book Notes - Selah Saterstrom "Slab"
Selah Saterstrom's novel Slab is a compelling and innovatively told story of tragedy and hope, and is one of the year's finest books. "Saterstrom’s strength as an author is her ability to straddle this line between the colloquial and the academic while offering us a deeply flawed protagonist who is both compelling and tragic." I was told once that sometimes, while writing, I look like a mad woman. I take breaks to pace. I pace out shapes – and there are other repetitions – a way of dealing with the energy, and this includes listening to certain songs over and over. Occasionally there is a content link between the music I am listening to and what I'm writing, but more often than not, listening to music while writing is about me getting inside particular frequencies that I am trying to presence/press through into the work. Sometimes I think it is like trying to press light through meat, so that it shines, on the other side. I wish I could explain it better. Like: wanting a touch between two hope-poor lovers to feel what I feel when I pass through the concentric rings of longing inside Rachel's "Family Portrait." Like needing the greasy concentrate on a heat-stroked body to reflect the gutted way I feel when I listen to R.L. Burnside's "Going Down South." Here is a very small sampling from a larger list of some songs and recordings I listened to while writing the novel Slab, as well as a few notes. I have Akilah's copy of The Art of War. Tucked in its pages, a brief note: she wrote that she intuitively felt a time was coming when I was going to need this book, and she felt I should have her copy. The book arrived in the mail the day I learned of her death. I couldn't open the package for six months. I lied to Akilah only once and that lie was about writing. It was not a big lie. It was a poor, transparent attempt towards explaining why I had not replied to a letter. But then that lie became shockingly and absolutely true after her death. And then that truth became the slab under Slab, the most important aspect of the book. I love her voice in this recording. Hong Ting's traditional album features a guzheng, a zither-like instrument that sounds sort of like a twangy-harp, but the twangs are oval, ache-shaped. Why did I listen to this song so many times? It was recently explained to me that the strings of a guzheng are elevated over a wooden board and the musician's fingers must work in such a way as to pitch-bend the notes. So: something about the kelp-green rooms inside the pitch-bend, as a novel location. I would sling this song on a loop and for long stretches. I feel the whole drama in this song – the one about absence becoming presence. There is also something in this song that is about duration. I think of Tarkovsky's Nostalghia, the scene in which a man attempts to walk the length of an abandoned mineral pool while holding a candle. Mathieu Kassovitz's film La Haine made a huge impression on me, and also influenced the way my writing eye saw the disaster/landscape in Slab. I estimate that I watched the scene in which this song is featured at least a hundred times while writing Slab, and the filming is so brilliant – such an accurate portrayal of a place in a certain moment – and I thought: I need my writing to see like this camera moves. Nothing I could say about this song approaches just listening to it, which I hope you will do right now. What I want to say is: there are a lot of spirits in this song. Thinking about it now, it occurs to me that this is also a song about writing. Well what's John a writing? Ask the Revelator. What's John a writing? Ask the Revelator. What's John a writing? Ask the Revelator. A book of the Seven Seals.